When I first started losing weight, I was not a very big vegetable eater. I started looking for ways to make them tastier so that I actually wanted to eat them. I made these one day, and my family was sold. 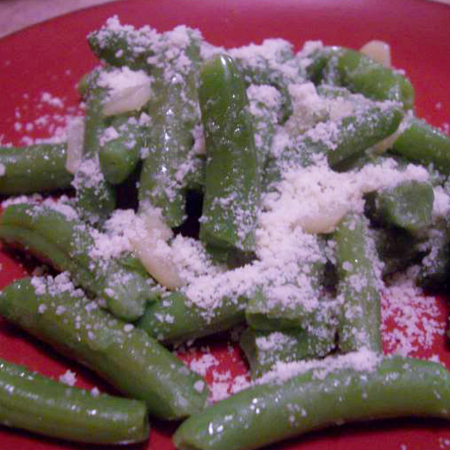 They are SO good--if you like garlic and cheese, you will love these green beans. Even my husband, who is a complete "meat & potatoes" guy, told me to make these much more often. In a skillet over medium heat, add oil and butter. Peel each clove of garlic (it takes some work, but trust me, it's worth it!) then slice into very thin slices. Add the garlic to the oil and sauté until the garlic is BARELY golden (you don't want to burn it, so keep the heat at medium/medium low). Add the green beans and stir to coat the beans with the oil/butter. Cook until the beans are heated through, just a couple minutes. Sprinkle 1 Tbsp. parmesan cheese over each serving. Makes 4 servings.